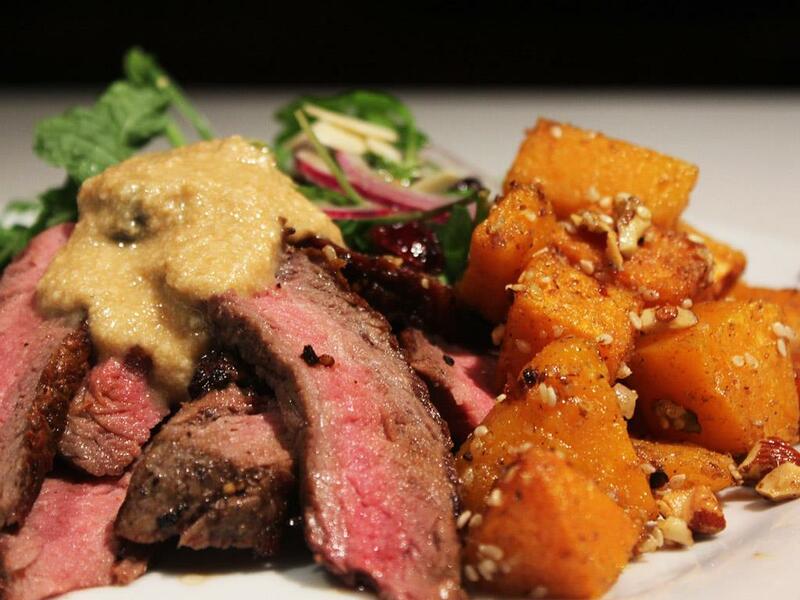 Sirloin steak strips slathered in a scrumptious home-made Tahini dressing accompanied by dukkah crusted butternut and a salad made from peppery rocket, dried cranberries, flaked almonds, red onions and lemon dressing. Put the following ingredients in a large mixing bowl: dukkah, chilli flakes, salt and a few glugs of olive oil. Mix well. Now add the butternut and toss until well covered with the dukkah mixture. Lay the crusted butternut chunks on a greased baking tray. Roast in the oven for 20 minutes. Put a dry griddle/frying pan on high heat. On a chopping board rub both sides of the steak with salt, pepper and olive oil. Place steak in hot pan and sear for 2 to 3 minutes either side for a medium steak, turning only once (using tongs/spoons). Adjust time to suit your preference (up to 7 minutes per side for a medium steak). When done, remove and set aside on a plate covered with tin foil to rest for about 10 minutes. Toss the salad ingredients in a salad bowl: rocket, red onion slices, dried cranberries, almonds. Mix the lemon juice and olive oil (see Rocket Salad ingredients for quantity above) and pour over the salad. Whisk tahini base with olive oil (see Tahini Dressing ingredients for quantity above), garlic and a little salt. Using a very sharp knife, slice the steak against the grain: this means cutting across (and not parallel to) the long parallel muscle fibres in the meat creating short fibres and delivering tender slices of meat. To serve, divide the steak slices, salad and butternut chunks on the plate. Drizzle the steak with tahini dressing.